Deck out your Tumblr profile with a banner that shows off your personal flair with Canva’s easy-to-use banner maker. A great Tumblr blog needs a banner, just like a newspaper needs a masthead or a book needs a cover. Adorn your Tumblr blog with a stylish banner in just a few clicks with Canva! Whatever your theme, Canva comes with the tools to accentuate your blog and make it sparkle. Not literally sparkle, of course (unless you’re into that). Fonts of all shapes and styles, plenty of backgrounds, and a library of over 1 million stock images and graphics are at your fingertips with Canva’s Tumblr banner maker. Need awesome graphics for your Tumblr blog instead? We’ve got those too! Create a new Canva account to get started with your own Tumblr Banner design. Not sure how to start? Canva comes with lots of elegant, free text layouts to choose from. Simply click on the “Text” tool and scroll through to find a layout that’s right for you. Add your blog title, a groovy subtitle, or whatever else to make your Tumblr banner stand out from the crowd. With just a few more clicks you can even change the colors, size, or anything else to make the design yours. Next personalize your banner by uploading your own photos, or choosing from our huge collection of over 1 million icons, illustrations, and design elements. Canva comes with plenty of free graphics to choose from and premium graphics available for only $1. Whether you use our online interface or our free iPhone, iPad or Android apps, Canva makes adding your new banner to Tumblr easy. Once you’re done designing, simply export your amazing creation as a PNG file, which is perfect for the web. Then upload your file to your favorite image host, and drop the URL right into Tumblr’s blog customization tool. After your new Tumblr banner is a hit with your followers, why not share the wealth? 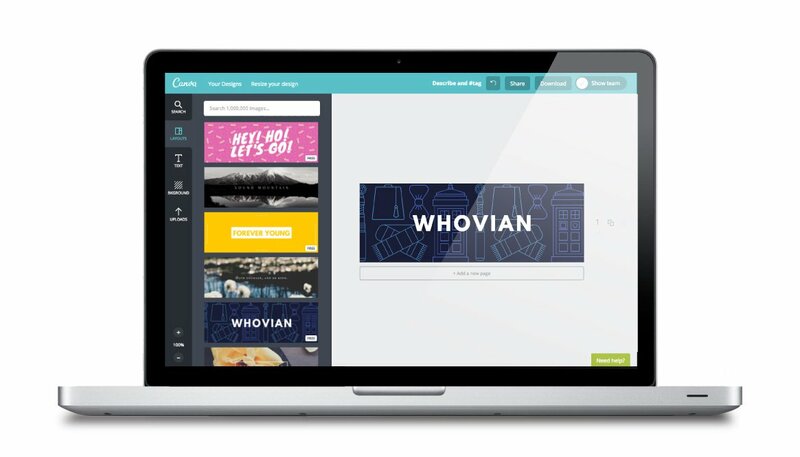 With Canva it’s easy to share your design on Facebook, Twitter, or anywhere else. Just open your Tumblr banner design in Canva and click the Share button. You can choose to post your banner to your other social media accounts or even send out a link to an editable version of your design.